We are delighted to report that about 50 young oak seedlings have been raised successfully by Nicholsons, ready to be planted at the OneOak site this coming Winter. If you have been following the story about the seeds so far, you will know that the OneOak tree did not produce any viable seeds in the Autumn before it was felled. However, with the help of school children and the staff at Blenheim Palace we did manage to collect acorns (oak seed) from some of the wonderful ancient oaks around the Blenheim Estate. 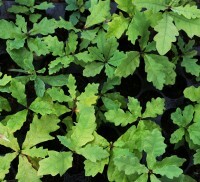 These fifty oak seedlings have been skilfully raised by the nurserymen and women at Nicholsons during this summer. We will need to bring in some additional 200 other oak seedlings ready for the planting of the site this Winter. Every one of the 250 children who watched the tree being felled, and who have been working in so many other ways with us in the OneOak project, will soon be returning to the woodland to each plant one young tree. OneOak Seedlings at Nicholsons. Photo Jane King. Our thanks to Jane King for the photos, and our admiration to Nicholsons for their green fingers. You can read more about the seed story by searching for ‘seeds’ in the search box. All slices have now dried out with this spell of warm weather, and radial sections have now been cut, and the surfaces have been planed and sanded to a very high standard of smoothness, essential to ensure every ring can be clearly seen and measured under the microscope. Even so, there is a band of rings in the first large branch, 33 feet above the ground, which was found to be rotten. This branch has had a very serious injury to it sometime in the past and had virtually died, with a band of exceptionally narrow rings which will be almost impossible to measure, let alone count. This is the branch that they had hoped to use as a brace at the Wallingford Museum but was found to have a rot pocket when cut; this is directly related to this band of very narrow rings. Another interesting fact is that the preliminary ring count of the base of the tree, at one foot above the ground, is about 225 years, so the tree seems to have started growing shortly before 1785. So, the tree experienced some form of major damaging event in its past, and it is about 65 years older than we thought. The exact details have yet to confirmed but a planting date of 1785 or before would place its planting during the major landscape design phase of the Blenheim Estate undertaken by ‘Capability’ Brown. In November we wrote about the children collecting oak acorns from the many beautiful oak trees around the Blenheim Palace Estate (read more here). 2009 was not a good year for oak seed collecting as very few trees had produced many acorns. We had feared that even the 50 seeds that we thought looked healthy, still might not germinate. Under the skillful watchful eyes of tree nursery Nicholsons we are all delighted that many of the acorns have germinated. 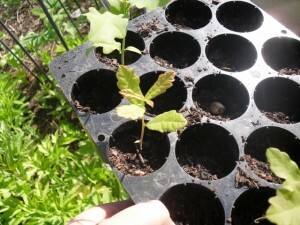 A new generation of OneOak trees are now growing strongly. We will soon be planning the replanting of the woodland area where the OneOak tree was felled. We will have to add another 200 or so oak seedlings to our own Blenheim seedlings, so that every child involved in the project can plant a tree. The replanting will probably take place in February 2011. Nature is repairing herself at the woodland where the OneOak tree was felled in January 2010. Foresters at Blenheim Estate have also given nature a helping hand by leaving habitat piles. Piles of branchwood have been left to provide homes for wildlife, for small mammals such as voles, and for insects and fungi that thrive on decaying and dead wood. These piles of wood will also return essential nutrients to the soil and help the next generation of trees to grow. When the massive OneOak tree was felled the woodland instantly changed. The absence of the majestic spreading crown of the OneOak tree was stark although more winter sun warmed the woodland floor. Marks in the leaf litter from forestry tractors and hundreds of trampling feet were still visible two months later. Now that Spring has arrived the transformation of the site is well underway. Bluebells are in full bloom and the first fronds of bracken unfurling, even in between the tractor treads and around the stump of the OneOak tree. We look forward to returning in the Autumn to plant the next generation of oak trees. Click on the images below to see more.